California Roadside Survey Finds Twice as Many Weekend Nighttime Drivers Test Positive for Other Drugs as for Alcohol; Marijuana as Likely as Alcohol CESAR. 1 California Roadside Survey Finds Twice as Many Weekend Nighttime Drivers Test Positive for Other Drugs as for Alcohol; Marijuana as Likely as Alcohol CESAR FAX U n i v e r s i t y o f M a r y l a n d, C o l l e g e P a r k A Weekly FAX from the Center for Substance Abuse Research Drugs that may affect driving were detected in one of every seven weekend nighttime drivers in California, according to data from the first statewide roadside survey of alcohol and drug use by drivers. Anonymous breath tests, oral fluid samples, and responses to questionnaires were collected from a random sample of weekend nighttime drivers in nine California jurisdictions. Twice as many drivers tested positive for other drugs (14.0%) as for alcohol (7.4%), and just as many drivers tested positive for marijuana as for alcohol (see figure below). Marijuana (either alone or in combination with other drugs) was the drug most likely to be detected, comprising 53% of all drug positives. The study also found that 23% of those testing positive for alcohol tested positive for at least one other drug, usually marijuana (data not shown). The authors caution that these figures describe the prevalence rates for the presence of these drugs in drivers and do not address whether those drivers were impaired by these substances (p. 2). Percentage of California Nighttime Weekend Drivers Testing Positive for Alcohol or Drugs, 2012 December 3, 2012 Vol. 21, Issue 48 SOURCE: Adapted by CESAR from Pacific Institute for Research and Evaluation (PIRE), Results of the 2012 California Roadside Survey of Nighttime Weekend Drivers Alcohol and Drug Use, 2012. Available online at http://www.ots.ca.gov/Media_and_Research/Press_Room/2012/doc/2012_Drug_And_Alcohol_Roadside_Survey.pdf. NOTES: Data are from a random sample of nighttime drivers interviewed on Friday and Saturday nights from 10 p.m. to midnight and 1:00 a.m. to 3:00 a.m. Data were collected on one weekend in eight communities and on two weekends in one community during the summer of 2012. Among eligible drivers approached to participate in the survey, 81% (1,375 drivers) agreed to answer questions, 85.3% (1,449 drivers) provided a breath sample, and 77.3% (1,313 drivers) provided an oral fluid sample. The breath alcohol samples were analyzed for alcohol and the oral fluid samples were analyzed for nearly 50 drugs, including prescription, illegal, and over-the-counter drugs. The methodology was modeled after NHTSAs 2007 National Roadside Survey of Alcohol and Drug Use by Drivers (http://www.nhtsa.gov/Driving+Safety/Research+&+Evaluation/2007+National+Roadside+Survey+of+Alcohol+and+D rug+Use+by+Drivers). 301-405-9770 (voice) 301-403-8342 (fax) CESAR@umd.edu www.cesar.umd.edu CESAR FAX may be copied without permission. Please cite CESAR as the source. *The percentages for the BAC do not add to the total for Any Alcohol due to rounding. The percentages for Marijuana, Other Illegal Drug, and Medication do not add to the total for Any Drug because individuals may have tested positive for more than one drug. 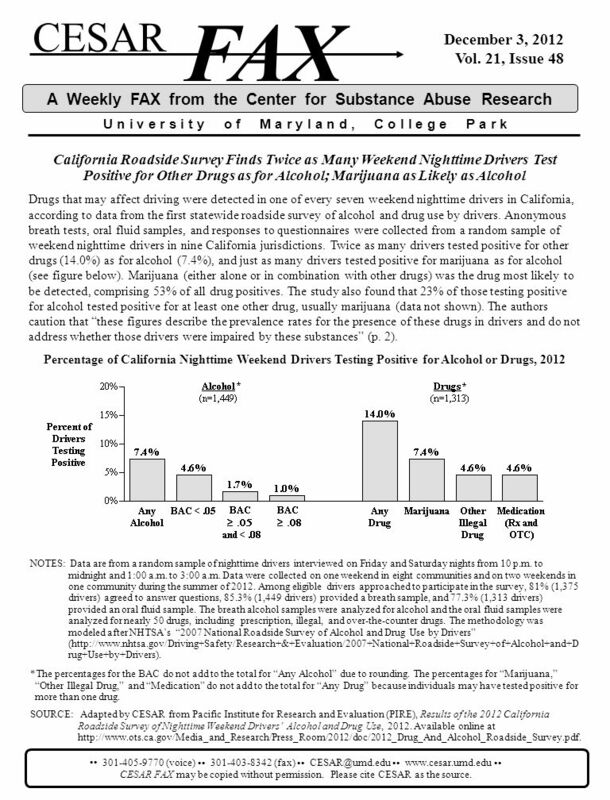 Download ppt "California Roadside Survey Finds Twice as Many Weekend Nighttime Drivers Test Positive for Other Drugs as for Alcohol; Marijuana as Likely as Alcohol CESAR." Survey Conducted: January 26-29, 2012 STATE OF CALIFORNIA DRUG POLICY REFORM BALLOT MEASURE ISSUES SURVEY. CESAR FAX U n i v e r s i t y o f M a r y l a n d, C o l l e g e P a r k A Weekly FAX from the Center for Substance Abuse Research February 4, 2013 Vol. Medicare Prescription Drug Benefit Progress Report: Findings from the Kaiser/Commonwealth/Tufts-New England Medical Center 2006 National Survey of Seniors. 2009 MPS Youth Risk Behavior Survey The Youth Risk Behavior Survey is conducted in public schools nationwide every two years. It is a critical measure. 2010 Healthy Youth Survey Data... Listening to Our Students Dixie Grunenfelder Learning and Teaching Support Office of Superintendent of Public Instruction. Life Opportunities Survey Ian O Sullivan ONS Social Surveys. How to Use this Presentation ♥ Schools can use the slides included in this presentation to inform staff members, students and their school community as. Parental proximity and changes in beer consumption between academic year and vacation periods Johan Rosiers - Association for Alcohol and other Drug problems. ©2012 MFMER | slide-1 Family History Information Helps Inform Chronic Pain Treatment Elizabeth Pestka, MS, PMHCNS-BC, APNG Cynthia Townsend, PhD, LP Emily. HR: Leading People, Leading Organizations © 2007 SHRM SHRM Weekly Online Survey: March 21, 2007 Employee Education Assistance Benefit Sample comprised. Everything you need to know but were too afraid to ask!! 9:00 – 10:00. College Students Who Use Energy Drinks More Than Twice as Likely to Initiate Nonmedical Use of Prescription Stimulants and Analgesics in Subsequent Year. Mental Health Service Needs and Service Use of Juvenile Detainees Karen Abram, Ph.D. Psycho-Legal Studies Program Northwestern University Feinberg School. CRICOS No J Deterring Drug Drivers: A Study into the Initial Impact of Oral Random Roadside Drug Testing in Queensland Professor Jeremy Davey ICADTS. © 2006 SHRM SHRM Weekly Online Survey: May 2, 2006 Open Enrollment Sample comprised of 397 randomly selected HR professionals. Analyzing 397 of s.
Powered by Southborough Library Customer Survey 2014 Saturday, December 20, 2014.